It looks beautiful already, Robin. I love the wisteria/peony combo. Your little dogs are so sweet and cute. Wow! I dream about an end result like your garden. Somehow the results of my labours never seem to look as good! Oh i could so easily sit and drink a cup of tea on that bench. It is all looking lovely. Too bad you’re too busy to sit in your garden, the girls seem to be enjoying its ambience. You’ve got me hankering after a picket fence on which to grow Wisteria. How lovely it all looks, Robin. 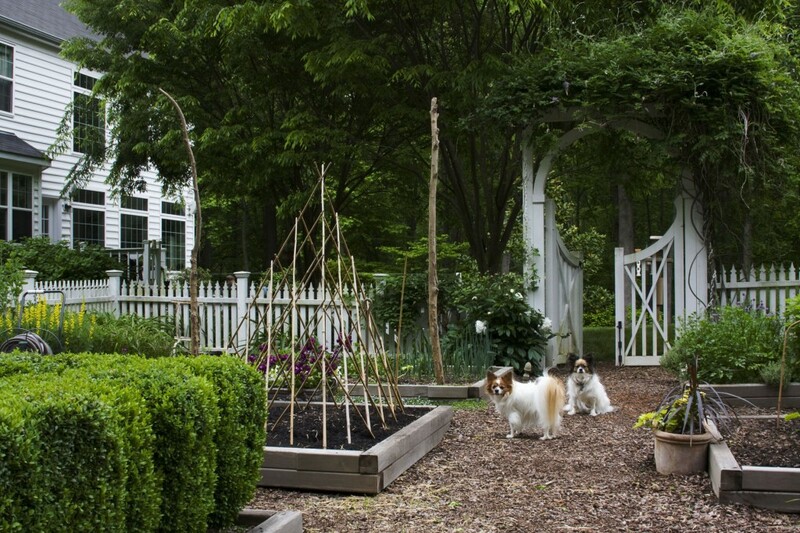 Desn’t it feel good to add big “bones” to the garden? I can’t wait to hear what you’ll be cooking from the potager. We are moving into high gear here, too. We are getting a new fence around our ‘potager’ but it is strictly utilitarians – to keep out the deer. There can never be too many flowering shrubs. 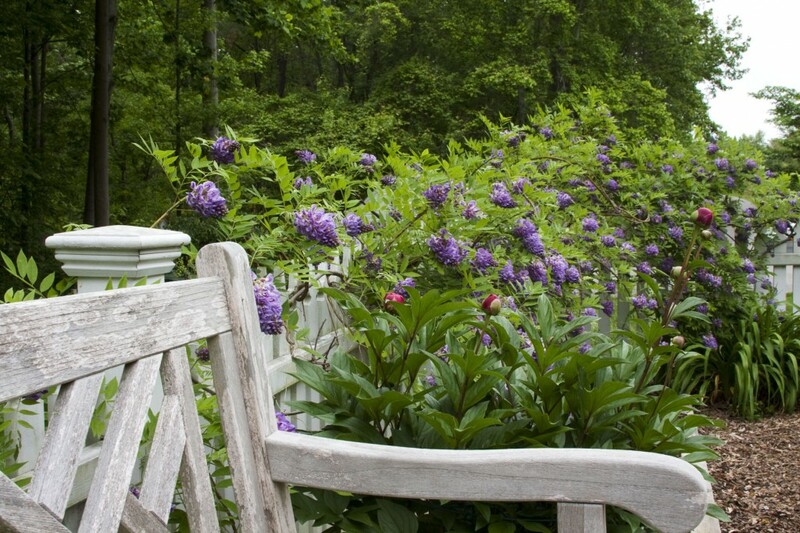 I have a question – Do you treat your wooden bench and your raised bed edges with any preservatives? The wooden bench is made from untreated cedar. I don’t do anything to the bench to care for it. Perhaps I should? I do keep the wooden legs from touching the ground though. The bench is sitting on stone pavers. The raised beds also are made from 4″ x 4″ untreated cedar posts. They were difficult to find–and expensive. But they have held up well for more than 6 years now.